For too many Londoners, housing is not affordable. For people on low incomes, this can mean a choice between paying their rent or heating their home. It has wider impacts too, on employers' and public services' ability to attract staff. London needs more, genuinely affordable homes. The 2016 London Plan defines affordable rented housing as a property with rent which is up to 80% of the market rate. While many Londoners would benefit from such housing, 80% of the market rate is still not affordable for people on low incomes. More social housing, with rents set at manageable rates for low-income tenants, must also be part of the solution. At Trust for London, we are supporting organisations to campaign on affordability, and to identify possible solutions. Citizens UK: on a strategic initiative to campaign for more affordable housing to be built in London. London Tenants Federation: giving extra capacity for their work, which tracks the affordability of 'affordable housing' and progress in delivering it. Generation Rent: to campaign for a better deal for private renters. We have also funded research on the affordability of London housing. 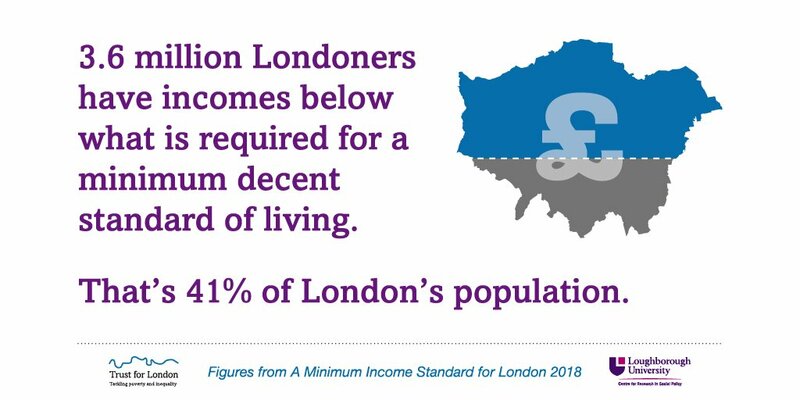 The London Minimum Income Standard highlights what it would cost to achieve a minimum decent standard of living in London, given high housing costs. We supported the London Fairness Commission, which made recommendations such as creating a 'living rent,' linked to incomes not market prices. Our funding to Policy in Practice's Living Standards Index for London helps to draw attention to the numbers of low-income Londoners who are struggling to make ends meet.